Smooth button closure ensuring ease of use.. Extra storage capacity for larger number of papers..
High Quality extra bright plastic material..
Special center sealing for better life and high durability.. Portrait wallet for upright filing, storage and presentation..
Saya Tr. 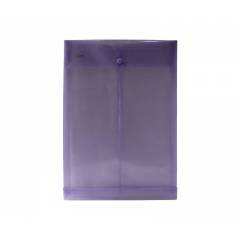 Purple Vertical Button Envelope, Dimensions: 255 x 18 x 410 mm, Weight: 58.4 g (Pack of 12) is a premium quality Document Bags from Saya. Moglix is a well-known ecommerce platform for qualitative range of Document Bags. All Saya Tr. Purple Vertical Button Envelope, Dimensions: 255 x 18 x 410 mm, Weight: 58.4 g (Pack of 12) are manufactured by using quality assured material and advanced techniques, which make them up to the standard in this highly challenging field. The materials utilized to manufacture Saya Tr. Purple Vertical Button Envelope, Dimensions: 255 x 18 x 410 mm, Weight: 58.4 g (Pack of 12), are sourced from the most reliable and official Document Bags vendors, chosen after performing detailed market surveys. Thus, Saya products are widely acknowledged in the market for their high quality. We are dedicatedly involved in providing an excellent quality array of Saya Document Bags.